Each cell of the body is animated by a highly organized and intelligent bioenergy, or bioelectricity. When cells are damaged, they become electrically imbalanced. Recently it has been discovered that microcurrent therapy--applying low-amperage electrical currents to the body--harmonizes the cells, returns them to a normal state of cellular activity, and boosts the body’s natural self-healing abilities. Combining this innovative new modality with ancient Taoist healing methods, Mantak Chia and Aisha Sieburth detail how to integrate microcurrent therapy with Chi Nei Tsang energy massage for pain relief, self-healing, and rejuvenation. 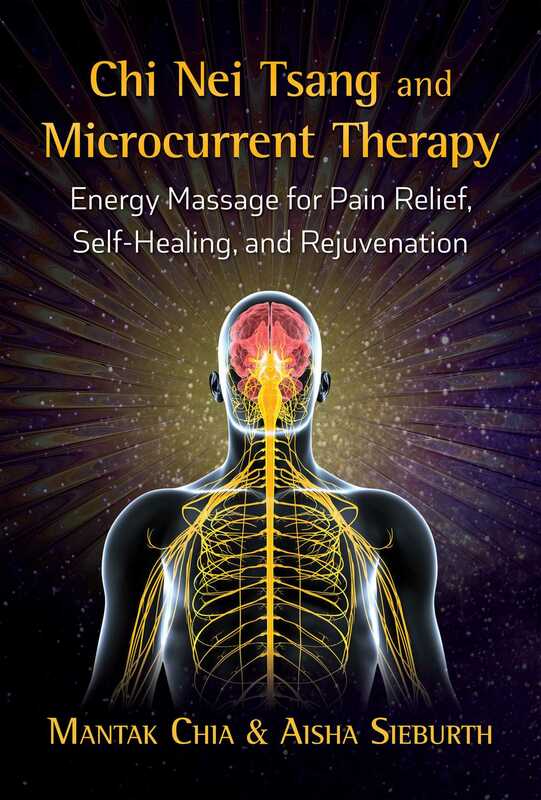 The authors explain how microcurrent has a regenerative effect on the nervous system, helping to increase energy levels, promote circulation of blood and lymph, relieve acute or chronic pain, restore pH balance of the blood, balance hormone function, and improve the immune system. Its effects on circulation extend to all the body’s vessels, tissues, and cells as well as enhancing toxin elimination and reducing inflammation. The authors show how microcurrent therapy pairs extraordinarily well with Chi Nei Tsang massage. The microcurrent, flowing through the hands of the massage practitioner into the body, enhances the effects of the massage within the nerves and tissues, making it easier to harmonize the flow of energy, release tensions, and dissolve energetic knots in the meridians. With illustrated, step-by-step instructions, the authors explain how to use microcurrent therapy during massage and describe the basic techniques of CNT massage. They also show how CNT microcurrent therapy is beneficial for general physical health and for a host of specific ailments, such as nerve pain, arthritis, sciatica, fibromyalgia, shingles, headaches, slow-healing wounds, and tendon and ligament pain. Chi, the life-force energy, moves through the body’s internal channels, nervous system, blood vessels, and lymph glands. These systems concentrate and cross paths in the abdomen, which acts as their control center. Tensions, worries, and stresses of the day, month, or year accumulate there and are seldom dispersed. These disturbances can cause physical tangling and knotting of the nerves, blood vessels, and lymph nodes. The result is the gradual obstruction of energy circulation. The ancient Taoists realized that negative emotions cause serious damage to your health, impairing both physical and spiritual functions. They understood that each human emotion is an expression of energy and that certain emotions could indicate the negative energy behind many physical ailments. They also identified a specific cycle of relationships between the emotions and the organs. For example, the experience of a “knot” in your stomach indicates the presence of worry, the negative emotion that accumulates in the stomach and spleen. The Taoists discovered that most maladies could be healed once the underlying toxins and negative forces were released from the body. They developed the art of Chi Nei Tsang--chi massage for the vital organs--to recycle and transform negative energies that obstruct the internal organs and cause knots in the abdomen. Chi Nei Tsang clears out the toxins, bad emotions, and excessive heat or heat deficiencies that cause the organs to malfunction. Microcurrent is a low amperage, pulsating current of electricity with a frequency just above the levels of the bio-electricity produced in the cells of the human body. Since this frequency is very similar to the electrical level of the body’s cells, microcurrent is easily absorbed and used by the body to boost its own healing process. Optimizing regeneration capacity, the technology of microcurrent is combined with classical Chi Nei Tsang massage techniques by sending low bio-electrical frequencies through the hands of the practitioner to enhance effects of the massage within the nerves and circulatory systems of the tissues. The result is increased relaxation, reduction of pain, reduced inflammation and improved nerve, immune, and circulation function. At the heart of this technique is working directly with the organs themselves, using Chi Nei Tsang massage techniques with deep and powerful effects for detoxifying, mobilizing, and realigning the physical tissues of the organs, ligaments, connective tissue, vessels and nerve plexus, which get easily tangled, congested, or blocked. Combining Chi Nei Tsang abdominal massage techniques with microcurrent will penetrate even more effectively into the deep tissues and nerve plexuses of the spine, tendons, fascia, and organs to manually mobilize deep energy blockages, release nerves tangles and tension, decongest lymphatic fluids, and restore optimum blood flow. Start by relaxing the abdomen with gentle, circular movements, scooping and spiraling the fascia around the navel center. Look for any tension or blockage that may need extra attention and gradually send current into those tense or blocked areas as you continue to work globally around the whole belly. Observe the changes as the difficult spots release and the belly becomes more relaxed. Work on releasing the psoas and the diaphragm, which hold the deepest levels of emotional tension. Then press into the organs to detoxify and invigorate them. Finish by activating the eight Wind Gates to release pent up “winds” or stale energy from the body. Advanced techniques focus on “combing” out the nerves and melting down sedimentation accumulated around the nerve plexuses themselves. This basic procedure is a potent way to free up and revitalize the nerve tissue of the vessels, spine, and organs to awaken the healing process within the body. Following general procedures, always make sure to place your fingers first, and then send the microcurrent. When you finish with an area, first remove the current, and then lift off your fingers so you do not create a shock. 1. Take time to relax the abdomen, gently scoop in a circular motion around the abdomen with your hands as you spiral the fascia tissue from around the navel center. 2. Scoop inward from the ribs and pelvis toward the navel. 3. Push, pull, and twist: one hand pulls while the other hand pushes the abdomen as though you were wringing out a sponge. 4. Press and spiral around the navel 3 times and activate the tan tien point below the navel. 5. Using one hand after another, scoop deep along the iliac bones of the pelvis, sending waves of microcurrent into the intestines, pelvic organs, ovaries, uterus, and bladder. 6. Scoop the psoas up from the pelvic bone. 7. Scoop the diaphragm downward and out from under the rib cage. 8. Glide downward along the ribcage, raking the ribs and sending current into the liver and gallbladder, stomach and spleen. 9. Scoop along the colon; press the soul gates, ileocecal valve, sigmoid colon, transverse colon, and small intestine. 10. Open the wind gates: polarize each point of the abdominal pakua between two hands, first polarizing the fingers north/south, then east/west, northeast/southwest, and southeast/northwest. Aisha Sieburth is a senior instructor of the Universal Healing Tao System. She lives and works in Avignon, France, as director of the School of the Tao of Vitality and Soulimet Association.